Can’t you find the right grab solution? Probably Custom is the right solution for you if you still haven’t found the right crane on our forestry, recycling or construction catalogs! 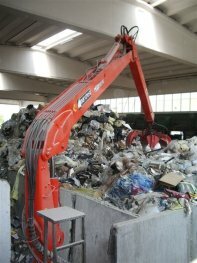 Custom is the right choice for those who cannot find the right Grab Solution in our range of products. Products out from the standard catalogues, an efficient answer to all the problems thanks to our design office that is in measure to solve the different complex situations of the heavy duty field. In Custom, we develop specific products for any application but the hook, with great performances and long duration in the heavy duty sectors. We know that nowadays the needs are even higher, we develop custom solutions for cranes on truck, crane for stationary installation, industrial applications and any harsh condition. 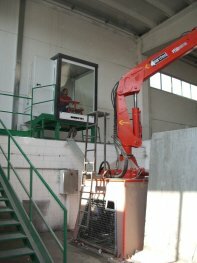 “A customer contacted Marchesi Gru asking us to install a stationary crane for a biomass energy plant. The customer owned an old crane that was at the end of its life and wanted to buy the same crane. 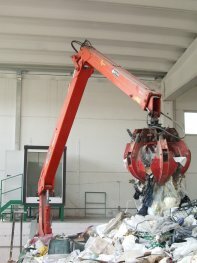 The original manufacturer, didn’t had anymore that crane in its range and therefore the Customer called us with a precise request regarding outreach and lifting capacity. The customer wanted a crane for a continuous work and we designed a slewing system on bearing with endless rotation (M-INFINITY). Our Technical Department designed the crane exactly like the customer wanted, with one hydraulic extension, 14 meters of outreach and a lifting capacity of 1,1 tons at the end of the boom”.